In celebration for Canadian rockers Thousand Foot Krutch’s new album, Oxygen: Inhale, coming out this Tuesday (one of my most anticipated albums of 2014) I want to look back at, in my opinion, their best album: Welcome to the Masquerade, the Fan Edition, since that is the version I purchased. This is easily their heaviest record, as it begins with the epic intro, the Invitation. This leads into an explosive album title track opener. It hits with you an adrenaline charged guitar riff that is just epic. Fire it Up is the pump up song of the record, and really gets the heart beating, with the best vocals from front man Trevor McNevan to date (until the new record comes out that is). A song about being on fire for God, and taking His presence to the streets. This is sure to get your feet moving. The album soon slows down after yet another rocker with Watching Over Me, a song about knowing the Lord is with us through every thing we go through. The Part That Hurts the Most (Is Me), is one of the best, most emotional tracks on the record. It’s pretty tame for the most part, until we get to the bridge, which again finds Trevor screaming his lungs out. The next ballad is Look Away. A beautiful song about not looking away when God calls us to Him, despite what others may say. This is the first song I ever heard from them, and I still love it five years later. Forward Motion finds them going down a more pop/rock route, and is one of the most enjoyable on the record. The album ends with the straight forward worship track, Already Home. This song is absolutely glorious, and if this doesn’t usher you into the throne room I’m not sure what will. Trevor’s voice is amazing, and in the last minute, it’s an amazing experience. You have to listen yourself to know how powerful this track really is. The bonus tracks aren’t anything really great, except for Take it Out On Me, a song about dealing with anger. The bonus trilogy of tracks begins with the rocker Shook, leads into Take it Out On Me, a heavy pop song (if that’s a thing) and ends with Anyone Else, another ballad about a relationship between two lovers, but can just as easily be about God. 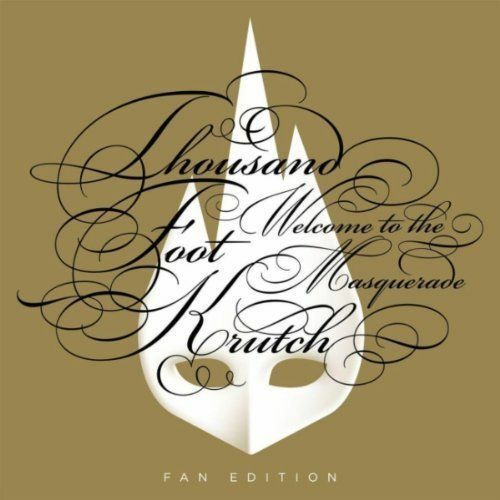 If there’s one rock album you buy anytime soon, if you haven’t already got it, Thousand Foot Krutch’s Welcome to the Masquerade is an absolute must have. Highly recommended!